Recently we went on a trip to California so the kids could have a vacation before school starts. 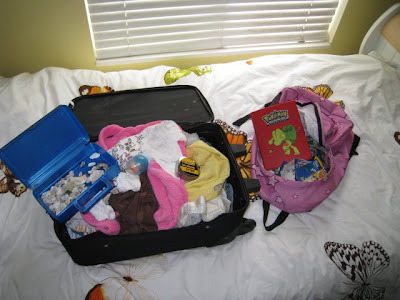 I put suitcases in their rooms so I could start packing when the laundry was finished. Emma decided to take matters into her own hands and pack her own suit case. 1. An old lunch box full of sea shells from our last trip to California. 3. Her entire Pokemon collection. 5. A spiral of lined paper and a pencil.